Most people assume that the Country House garden, with beautiful herbaceous borders and relaxing water features leading to secluded benches, has always been the quintessentially English country garden of cultural legend. Many people will never have heard of the name Edward Lutyens but it is unlikely that anyone will be unfamiliar with his work and contribution to British architecture. Following considerable success in his architectural career, Lutyens was appointed a principal architect for the Imperial War Graves Commission and was involved with the creation of many well-known commemorative monuments. This included the Memorial to the Missing of the Somme in Thiepval and most famously Whitehall’s Cenotaph, a design emulated in war memorials worldwide and now known as Lutyens designs. However, Lutyens began his first architectural commission in 1888 designing country houses and soon joined forces with horticulturalist Gertrude Jekyll to design the grounds and gardens. The 'Lutyens-Jekyll' garden combined the formal with the informal. Mixing the hard architecture of stairs and balustrade terraces with soft billowing lavender filled borders. The more carefree approach to garden layout was unfavoured by the previous generation in the 19th century, who preferred formal bedding schemes with regimented planting. This new 'natural' style was to define the typical English garden until modern times. The style became so popular it was actually named the Lutyens Country House garden. His work in garden architecture also led to his design of attractive outdoor seating which blended in seamlessly within the oasis of the garden; a design still highly sought after today. 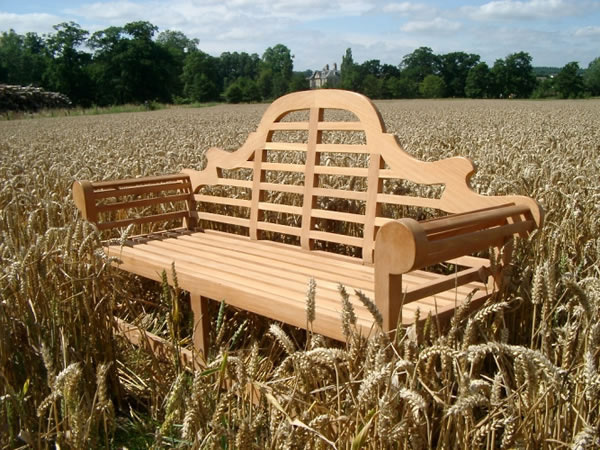 Why Buy a Lutyens Garden Bench? The popular Lutyens Bench range has an elegantly shaped back rest being scroll-shaped. It has rounded arms that also make this piece of furniture stand out from other standard and less remarkable benches. Available in two different sizes, 1.5m and 1.9m, these beautiful benches can accommodate two to four people and are every bit as attractive and typically English as the gardens they were originally designed for. Choose from a traditional natural wood finish or one painted with a choice of subtle Cuprinol garden shades. 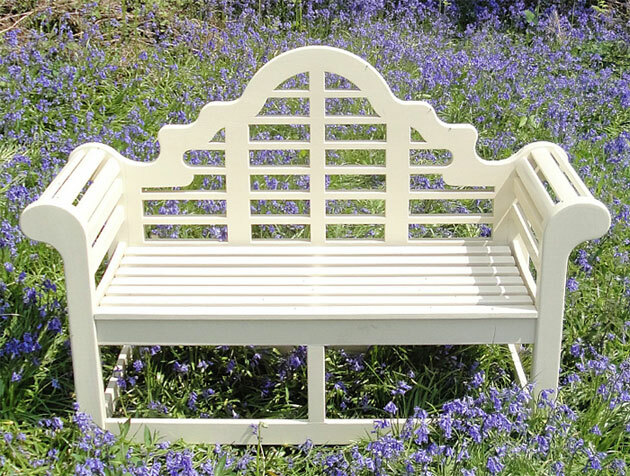 The Lutyens Garden Bench Range is constructed entirely of teak, which is a stunning and durable hard wood. These classically designed, unique garden benches are built to last and will age gracefully wherever you decide to place it – just as Mr Lutyens intended.